There comes a time when one would need to bid adieu to the past and consign history to, well, history. After all, there is not much point in trying to keep an old standard going when the rest of the world has moved on to something newer and better, right? There has been instances in the past that attempt to bridge the old and the new such as the Cassette MP3 Player, and here we are with yet another example in the form of the $49.99 Tape 2 GO-USB cassette Walkman. In a nutshell, if you still have a collection of cassettes that you would like to keep its music for posterity, then the Tape 2 GO-USB cassette Walkman would prove to be an invaluable ally. After all, you can easily rip all of your audio cassettes into the digital format, and even better news is this – this particular device will be able to play back chrome or normal cassette tapes, now how about that? Of course, this works best as a solution for those who do not have a CD copy of their existing cassette collection, and neither have they decided to download a digital version of their music collection. 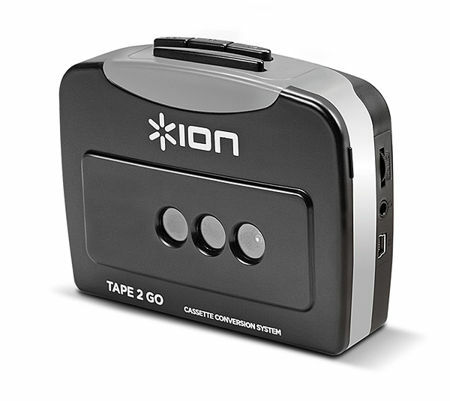 In addition, Ion’s Tape 2 GO-USB cassette Walkman will also arrived bundled with Ez Vinyl/Tape Converter software which allows one to convert audio into MP3 files via iTunes. It is a matter of but a few mouse clicks to help you obtain digital versions of your cassettes.